Gondwana Rainforests of Australia Properties. Brief description of the national parks and nature reserves that make up this UNESCO world heritage property in New South Wales and Queensland, Australia. The Gondwana Rainforests of Australia property is actually composed of a series of 8 distinct groupings of parks and reserves distributed between Newcastle and Brisbane, united by the common story they tell of Australia's unique and evolving rainforests. North west of Newcastle, and accesible via Scone, Muswellbroke and Gloucester, Barrington Tops National Park contains an unsurpassed mosaic of eucalypt forests and rainforest types, plus sub-alpine woodlands, swamps and grasslands. Self-guided walks through rainforest are provided at the Gloucester Tops and Williams River sections of the park. Carved out of ancient volcanic flows, the park rises from near sea level to over 1500m and protects one of the largest temperate rainforests in mainland Australia, along with a host of diverse habitats and wide range of birds and animals. A comfortable drive from the Gold Coast and the popular backpacker destination of Byron Bay, this group includes mountain views and lush rainforest which attract many visitors. Springbrook National Park features panoramic views over the Gold Coast and northern NSW from walks through subtropical and cool temperate rainforest. Lamington National Park protects the largest remaining tract of undisturbed subtropical rainforest. Wollumbin (Mount Warning) National Park protects the diverse rainforest communities which clothe this rugged mountain peak. Walks, scenic drives, dramatic lookouts and visitor facilities are provided in Border Ranges National Park, whilst Night Cap National Park provides excellent day facilities and walking tracks ranging from 30 to 60 minutes, through to half, full day and overnight hikes. From the rugged volcanic peaks of Mount Barney National Park which attract experienced, self-reliant bushwalkers, to the lush lowland subtropical rainforest of the Murray Scrub in Toonumbar National Park, there are many landscapes to discover in this group. These rainforests abound in fruit-eating birds such as fruit doves, bowerbirds and the rare Coxen's fig parrot. Facilities and walking tracks are provided in Tooloom National Park and Mallanganee National Park. Along with the Mount Nothofagus Flora Reserve, the Focal Peak Group World Heritage areas was declared inside Toonumbar, Tooloom and Richmond Range National Parks, in the 1994 CERRA relisting when these estates were still state forests. World Heritage areas are also declared inside Mount Clunie and Koreelah National Parks. The majority of these parks are accessible via Kyogle, Bonalbo and Woodenbong in NSW, and Rathdowney in QLD. Loccated north-west of Grafton and south of Tenterfield, Washpool National Park is a wild region of steep gorges, clear waters and tall trees, with the largest rainforest wilderness in NSW. Neighbouring Gibraltar Range National Park is renowned for spring-time wildflower displays. Visitor facilities are located off the Gwydir Highway in both parks. A network of marked walking tracks on the wilderness edge has been established, and visitors can choose from short walks of less than an hour, up to multi day wilderness walks. High rainfall and moderately fertile soils have contributed to the extensive development of rainforest in Werrikimbe National Park, ranging from subtropical rainforest at low elevations to warm temperate and cool temperate rainforest at higher elevations, with large stand of Antarctic Beech a feature. The rugged core of the park protects one of the largest declared wilderness areas in north-eastern NSW. The dry rainforests of Oxley Wild Rivers National Park are of high natural significance and a primary factor in inclusion of the park in the World Heritage Area, while the cool temperate rainforest and the tall open forests of the former Cunnawarra Flora Reserve prompted the inclusion of this area on the World Heritage List in 1994. The spectacular gorges of Oxley Wild Rivers National Park can be viewed from lookouts, camping and picnic areas located on the edge of the New England Tablelands. Added to the Hastings - Macleay Group in 2007, Willi Willi National Park on the eastern boundary of both parks, has considerably expanded the inscribed World Heritage area of this group. Iluka Nature Reserve contains the largest remaining stand of littoral rainforest in NSW. A self-guided walk explains the importance and fragile nature of this rainforest by the sea. 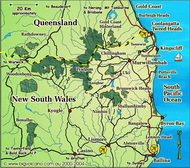 Main Range National Park covers 29,730 ha. Rugged mountain ranges, spectacular lookouts and rare wildlife feature in this prestigious Gondwana Rainforests of Australia World Heritage Area park. A mosaic of vegetation types occurs in the park. Rainforests grow in moist or sheltered locations, with open eucalypt forest occurring on the drier ridges and valleys. Montane heath vegetation grows on the cliffs and rocky outcrops. It contains unusual forms of subtropical rainforest which provide habitat for rare ground-dwelling birds such as Albert's lyrebird and the eastern bristlebird. Facilities and walking tracks are provided at Cunningham's Gap, Spicer's Gap and Goomburra. The Dorrigo Rainforest Centre is a major interpretation centre for the Central Eastern Rainforest Reserves. Explore the exhibits and the adjoining majestic subtropical rainforest of Dorrigo National Park. For unforgettable panoramas over forested wilderness, visit Point Lookout in New England National Park. Facilities are provided and there are numerous short walks to explore the cool temperate rainforest.